My Mom’s Party Punch rocks! I served this punch at both the bridal shower and the baby shower I threw in 2013. 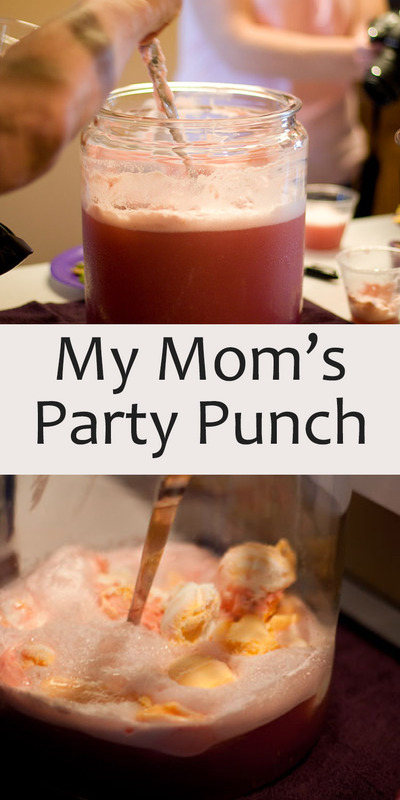 Before each of these parties I had to call up my mom and ask her again how to make her party punch. So, I thought I’d post the recipe and share it with everyone. Now I don’t have to bug my mom each time I have a party. Everyone loves this punch, and it’s always gone by the end of the party! It’s sweet and refreshing like dessert, just the thing for a lovely girly party. One of the things I love about this punch is that you can switch it up as you want. Use ingredients that get you a color you want, so you can match it to your party theme colors. Or, use flavors you like. Make it how you want it! We had a pink theme for the bridal shower, and I used cranberry juice & rainbow sherbet for a pretty pink punch (raspberry sherbet would’ve been great too). Apple juice and pineapple sherbet will get you a yellow punch. Try rainbows too! Place everything in a large punch bowl or big jar. Serve with a ladle. And, it's always a good idea to have a Sharpie to write guests' names on their plastic glasses so you don't have to throw away so many glasses. Thanks! My mom made this too, but I had forgotten what went into it! I love a good punch! We make a similar one at our office Halloween party every year.